This holidays are swarming with baked goodies. Without fail, mint is usually one of the star ingredients to a good portion of the holiday recipes. People go crazy for that mint-chocolate duo. And why not? It is heavenly! My aunt is known for these during the holiday season. The recipe is actually in my grandma’s cookbook, but I am pretty sure my aunt makes them way more than any person in our family! I normally have a brownie recipe I swear by and never venture from, but I make an exception for this brownie recipe in this particular recipe. The brownies are so rich and fudgy, just what you would want with all the yummy layers. If you are looking for a delicious treat to add to your dessert plates this year, you really can’t go wrong with these! 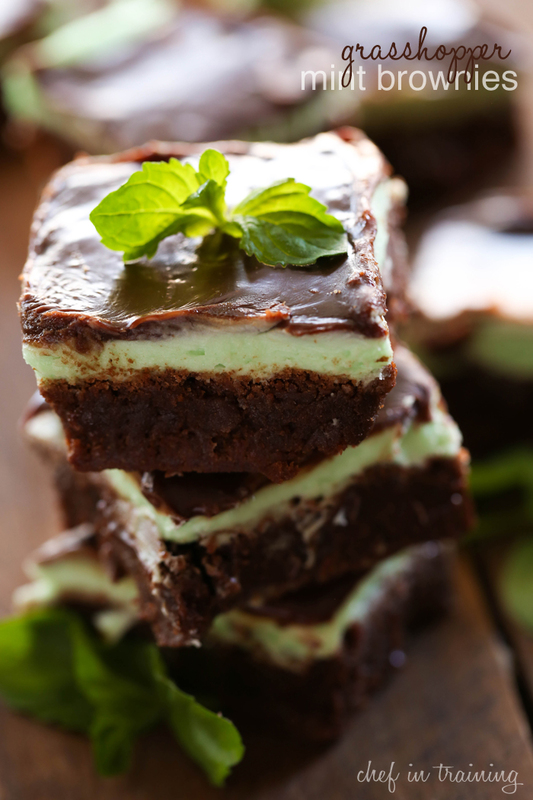 These brownies are fudgy, rich and packed with that chocolate-mint flavor combo perfect for the holidays! You won’t want to pass this one up! In a microwave safe bowl, melt chocolate and butter together in 30 second increments, stirring in between each increment until melted. Mix in eggs and sugar until smooth. Pour batter into 9x13 and bake at 350 degrees F for 20-25 minutes. In a medium mixing bowl, cream butter. Add powdered sugar, milk, mint extract, vanilla and green food coloring and beat until smooth. Spread over the top of cooled brownies. Combine semi sweet chocolate chips and cream in a small microwave safe bowl. Heat in 30 second incriminates, stirring between each increment until melted smooth. Stir in vanilla. I can't find heavy cream. Is this the same thing as whipping cream?